Notes: Installer won't run unless your system is set to Japanese or use Applocale. The leftmost button on the menu will start the benchmark. Appears to be framerate locked at 30FPS. Also known as "G1 Jockey". Buy Winning Post World from Play-Asia! 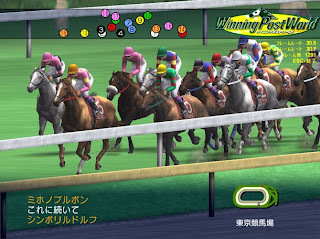 Winning Post World is the online version of the long-running horse racing simulator series, stretching back to the Super Famicom. Buy, train, breed and race horses. Let the computer simulate the race or saddle-up and be the jockey. Test your stable online against other trainers, managers, and jockeys.